Good Afternoon! What's a "not so simple simple card"? Well. . .although the card looks simple in design. . .it wasn't as simple to make. First of all the stitches that you see on my card was hand stitched. I used embroidery floss rather than thread. I was too lazy to use a sewing machine and thought that the embroidery floss would give my card a nice texture. To create the circles, I used a textured cardstock because it would stand out more than a smooth cardstock. I punched several circles and mounted them with foam tape. This was really fun card to make. lately, I've been a bit bored with my card designs. I feel a little stagnant. . .so, I wanted to create a design that is simple but different from my typical cards. I really like how it turned out!! The design was inspired once again from a sample from Scrapbook Trend magazine. In the magazine, rather than using circles, they used stars for the design. 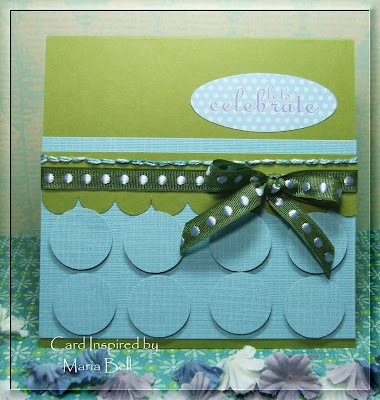 I think I'll make another card like this but I'm going to use flower punches. Very pretty card Maria! I luv the colors too! Great lookin ribbon! Very pretty. I love the hand stitching. How hard is it to line up the slip much to make the scallop edged? I've gotta give this a try. so cool, girl! I love it!! 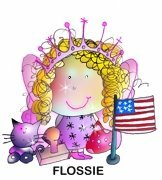 Love that you've used embroidering floss... i remember making "friendship bracelets" with those - remember those!? Lovely!!! This card is great, love all those circles and the embroidering floss is fantastic. The circles and your color choices are beautiful together. How did you manage to sew your card by hand, was it tough threading the card stock? I can't wait to see what you post tomorrow, I really like this sketch.